Those who attend are asked to bring a food item for donation to benefit the Food Bank of South Jersey. 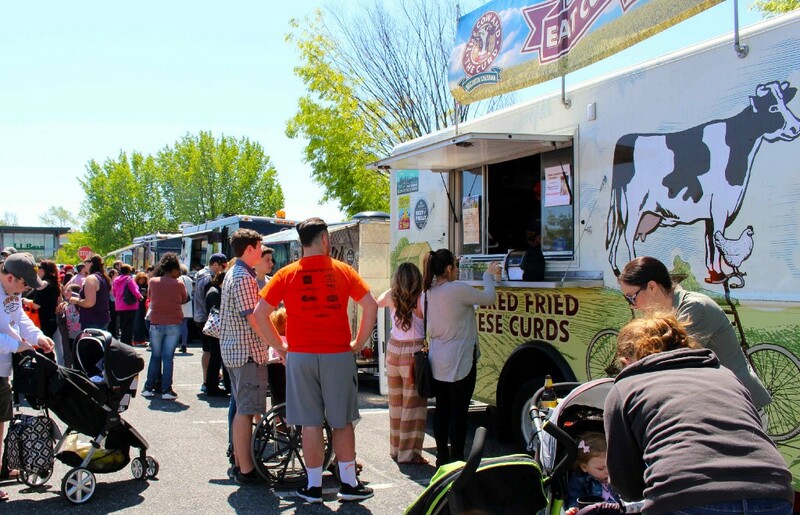 On Sunday, April 23, The Promenade at Sagemore shopping center in Marlton will once again host its “Sunday Funday” Food Truck Festival. From noon to 4 p.m., attendees can enjoy “street treats” from some of the area’s food trucks and sample local South Jersey wine. Guests to the event will be able to choose from a variety of vendors, including The Cow and the Curd, Dump-n-Roll, Flamin Foods, Mannino’s Cannoli, Beast of the Street, Jim’s Jarhead Jerky, Sweet Creations Bakery, Jeremiah’s Mobile, Curbside Creamery, Not Your Mama’s Tacos, Bacon Broads, and more. Wine tasting will be provided by Unionville Vineyards and Hawk Haven Vineyard. Visitors who attend the event are asked to bring a food item to benefit the Food Bank of South Jersey. Donations from the previous food truck event at The Promenade added more than 2400 pounds of food to the bank. Donations at this year’s event will be accepted at the event’s entrance located in front of Anthropologie. The Food Bank of South Jersey is a non-profit organization that annually links nearly 10 million pounds of food with approximately 250 charitable food providers, such as food pantries, community kitchens and shelters in Camden, Burlington, Gloucester and Salem Counties. The Promenade at Sagemore Concierge Services will also collect donated food goods from Friday, April 21 to Sunday, April 23. The Promenade at Sagemore is located one mile south of the Route 70 and Route 73 intersection between Evesham and Brick Roads, on Route 73 in Marlton. Additional parking and Trolley Shuttle is available at the Sagemore Corporate Center. For more information, contact The Promenade concierge at (856) 985–3846 or visit www.thepromenadenj.com for details.